This entry was posted on Saturday, May 17th, 2008 at 9:58 pm and is filed under Bankers, Information sharing, Predatory franchise lending, SME Loan guarantee programs, WikiFranchise.org. You can follow any responses to this entry through the RSS 2.0 feed. You can leave a response, or trackback from your own site. After our family’s failure with The UPS Store Franchise, I started to research the industry of franchising in an effort to find out what happened to us and others, and why? Were we victims? How had we contributed to our own bad outcome? Were we tricked by appearances and advertising and a government disclosure document that was misleading? How many franchisees fail and are hidden from public view, etc. and from the view of new buyers? Why wasn’t there greater public knowledge about the dangers and the great risks inherent in franchising and in franchise agreements? Is this all legal? In the beginning of my original research, I came across Les Stewart’s website and definitions of franchise terms, etc.. and for the first time, I was comforted in that my suspicions and uneasy feelings about franchising were confirmed by another, who had experience and great knowledge about franchising. Les Stewart was trying to spread the word and he didn’t pull any of his punches about the “evil” of the very nature of franchising in terms of the cruel and brutal exploitation of the weaker party with immunity and impunity under existing laws. I wrote or called Les Stewart (can’t remember which) and I was comforted to find another human being who not only could identify with the pain but who had great expertise and knowledge about the industry and its practices and the great “malice” that so often lies just below the surface of the sales hype and actual sale in the form of the “franchise agreement.” The franchise agreement DOES put a loaded gun in the hands of the franchisor who knows he can kill you in arbitration and the courts or hold you hostage for ten years or more with no profits with immunity and impunity under the law. Franchisors are not subject to the constraints of “truth in advertising laws” and are free to put frosting on the carrot that is then disclaimed in the actual franchise asgreement. It was Les Stewart who introduced me to the Blue Mau Mau Site and who suggested that I could learn and post my observations, as well, and that I would perhaps help myself as well as others to understand the “bad” experience, and that others might be warned, as well. I did learn from Blue Mau Mau and I did post my own comments for many months, but eventually I was blocked from this site as well as Franchise Pundit because, I assume, of my criticism of the FTC Regulatory Policy and my belief (confirmed by experts and attorneys) that this regulatory policy of the FTC was developed to protect the franchisors at the expense of the prospective franchisee, who does not get disclosure of the material risk of the investment itself under the provisions of the FTC Rule that governs franchising and the State disclosure document, the FDD (formerly the UFOC). It seems obvious to me, if not to others, that The FTC Rule does not mandate UNIT financial performance statistics be disclosed by franchisors and after 30 years, the majority of the franchisors in the US make no representations whatsoever concerning the performance of their unit franchisees in the official disclosure document —not even an “earnings” claim. 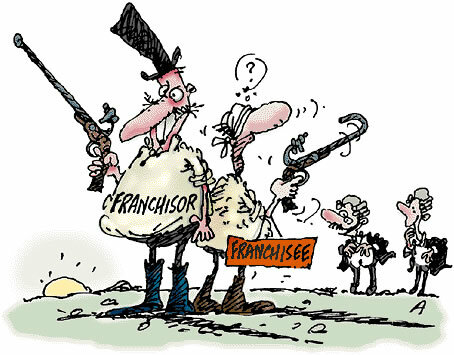 This, of course, together with their carefully designed contracts with the Integration and Reliance Clauses gives the franchisors almost 100% protection against charges of fraud in arbitration or the courts and the permission to lie, cheat, and steal, as needed, to maximize the profits of the System. The Internet and the great University of Google does act as The University of the People of the world in the Global Economy and it will be more difficult for franchisors and the status quo of big and little franchising to continue to HIDE the truth about franchising from the public who buys them. Hopefully, Les Stewart and the other “experts” who warn will make a difference and, hopefully, I, an amateur investigator and reporter-poster. can help as well. Les tells me that he welcome my comments and will not bar or block my computer because I am politically incorrect. I would rather listen forever to one amateur but authentic voice then have to wade through the lies and BS that passes for “franchise expertise”. I have never considered this a popularity contest and I live with my life’s choices every day. Often, money costs too much and there are a lot worse things than economic poverty. Carol, the smarter apologists know the Mom-and-Pop phase of franchisng is over. They know 1,000 times more than I do but you and I know the odor of decay when when we smell it. It’s not IF, but When they will come groveling.